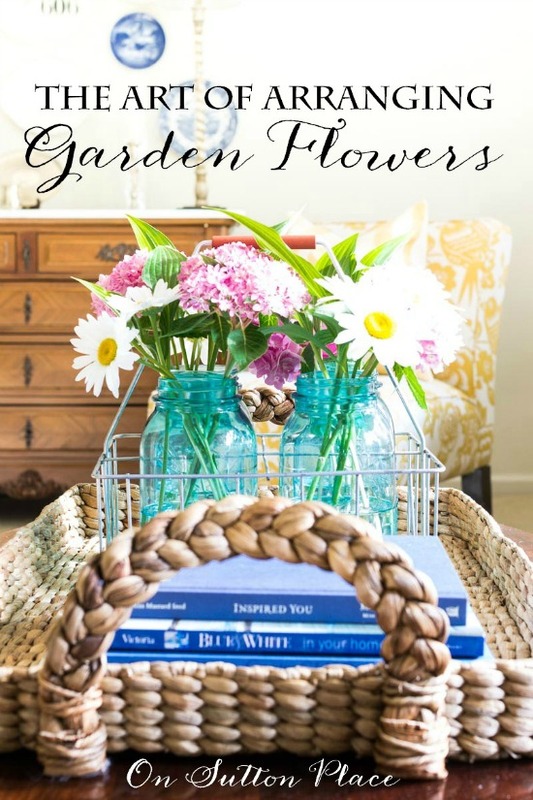 5 Tips for Arranging Garden Flowers | Tips for harvesting flowers from your garden, ideas for containers and ways to keep them fresh. I love all kinds of flowers. I think they are one of life’s loveliest pleasures and can’t imagine my home without them. I I love dried flowers and preserved greens. I adore grocery store flowers…but of all the flowers in the world, my favorites are the ones cut from my very own garden. I have hydrangeas, peonies, daisies, phlox, lavender and black-eyed susans. I can’t wait for the buds to appear and then for the flowers to bloom. I’ve spent many happy hours in my garden with a bucket of water beside me, snipping flowers. I love having arrangements in every room. I’ve put together 5 tips for arranging garden flowers that have worked for me. Cut the stem and strip the leaves. Leave any leaves that are near the bloom. These first two tips are done outside, in the garden. Gather your snippers and a bucket of cool water. As soon as you cut a stem, strip all the leaves except the ones very near the bloom. You want to have a bare stem below the water line in your container. I usually strip my stems right in the yard at the edge of my garden. They are easy to pick up and occasionally I can time it so they get mulched in the mower. Plunge the stem into a bucket of cool water. After you have stripped your stem of leaves, plunge it immediately in the bucket of water. Move the bucket around with you so as you cut and strip, the flowers can be put in the water. This is especially important in the summer months when it’s hot. Flowers can wilt and fade in just a few minutes. Use a container that reflects your personal style. It’s just my opinion, but I think the container is as important as the flowers. Use something that reflects your personal style…or has a special meaning. My favorite containers are vintage mason jars, enamelware containers and pitchers. All of these are perfect for Farmhouse Style. If you love clean lines and a more modern look, go with a glass cylinder. Silver and ironstone are also great choices and can be used with many different styles. Give the ends a fresh snip. Now to make your arrangements. On your kitchen counter or other surface, set your bucket of flowers, your snippers and your container(s) filled with cool water. As you remove your stems from the bucket, give them a fresh, angled snip before you put them in your container. The open end will quickly absorb water, thus extending the life of your arrangement. The back and forth movement, between the bucket and the container, is relaxing and therapeutic. To make your arrangement last longer, re-snip the ends and change the water. So you now have one, or more, lovely flower arrangements sitting around your home. In order to enjoy them for as long as possible, it’s important to pamper them a little. Every other day, empty the containers and refill with fresh water. Another trick is to re-snip the ends of all the stems. This will open the wood up again so the fresh water can be absorbed. I also hope you aren’t tired of gardening posts because I’ll be back on Saturday as part of the Summer Simplified Tour…sharing 5 Ways to Simplify and Enjoy Your Garden. See you then! What name are you under on eBay? Having an issue finding you. Thanks for sharing, Ann! 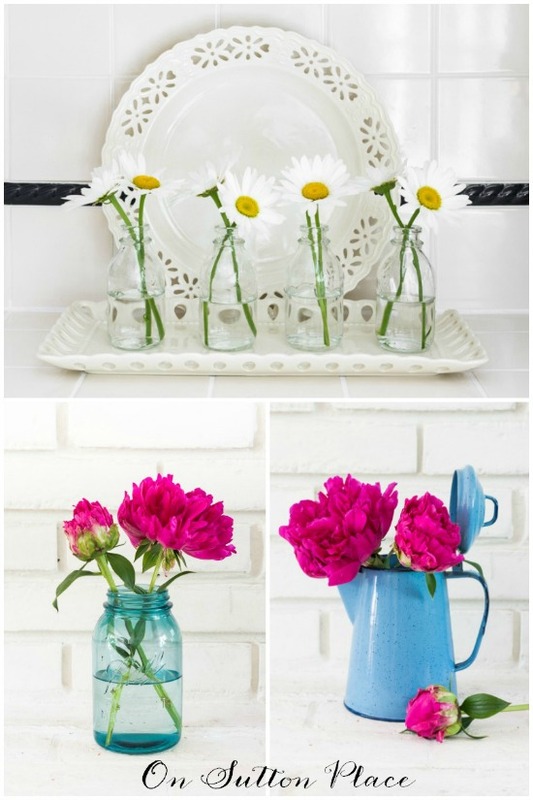 I love flowers as well and always need new ideas on how to arrange. Your blog is always so lovely and inviting when I stop by. Just love the fonts and bright, vivid photos. Keep up the great work! Love that first pic Ann. I transplanted peonies this year, about 25 plants from my grams house and they have a few buds so I hope they bloom this year. I figured they’d be stunned and not produce this year but I hope I’m wrong.